LOS ANGELES (AP) — Southern Californians weathered a second straight day of devastation Saturday as wind-blasted wildfires destroyed 500 mobile homes, shut down major freeways and forced thousands of residents in the path of flames to flee to safety in three counties. A fire that ravaged the Sylmarcommunity in the hillsides above Los Angeles’ San Fernando Valley grew to 6,500 acres — more than 10 square miles — and was only 10 percent contained. It sent residents fleeing in the dark Saturday morning as notorious Santa Ana winds topping 75 mph pushed flames; torched cars, mobile homes and bone-dry brush. Gov. Arnold Schwarzenegger declared a state of emergency in Los Angeles, a day after he did so to the northwest in Santa Barbara County, where 111 homes burned to the ground Thursday night in the wealthy, star-studded community of Montecito. And as many as 52 homes, some of them apparently mansions, were damaged or destroyed in a fire in Orange and Riverside counties, officials said. About 2,000 acres were charred, with more than 12,000 people in 4,500 dwellings under mandatory evacuation orders in Anaheim alone. Evacuation figures in other cities were no longer available. 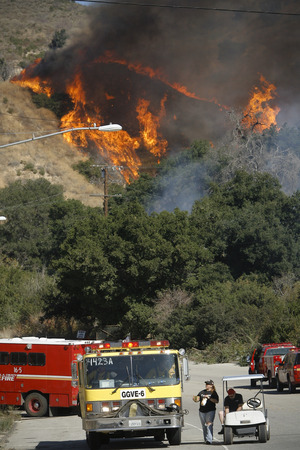 The flames erupted in a stretch of Santa Ana River bottom near the 91 Freeway and quickly grew to at least 800 acres. Fierce, erratic winds pushed it into an adjoining subdivision, where 5,000-square-foot homes are the norm. The Los Angeles blaze, whose cause was under investigation, threatened at least 1,000 structures, city Fire Department spokeswoman Melissa Kelley said. A burned resident was in serious condition, and four firefighters were treated for minor injuries. Fire officials estimated 10,000 people were under orders to evacuate. Among them were residents of the Oakridge Mobile Home Park, where about 500 trailers were lost to the flames. Many had housed senior citizens.